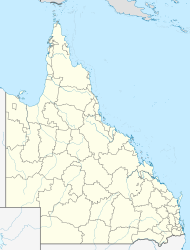 Bargara /bəˈɡɑːrə/ is a coastal town and suburb in the Bundaberg Region, Queensland, Australia. The town lies 384 kilometres (239 mi) north of the state capital Brisbane and just 13 kilometres (8 mi) east of Bundaberg. Bargara is considered to be a satellite suburb of Bundaberg, with only sugar cane fields separating the two centres. Between 1912 and 1948, a railway connected the two centres. At the 2011 census, Bargara had a population of 6,893. Bargara has grown significantly over the last decade, becoming a popular tourist and retirement destination. The main streets of Bargara are The Esplanade and Bauer Street. The Esplanade runs along the Bargara Beach foreshore, and is lined with several modern holiday homes and units. Bauer Street contains several hotels, restaurants and clothing shops. Bargara is also a popular fishing, swimming and surfing location. The Mon Repos turtle rookery is located just north of Bargara. A wall in the reserve dating back to the very early days of settlement was constructed using Kanaka labour and rocks taken from the nearby sugarcane fields. Most of the coastline of Mon Repos is part of the Mon Repos Conservation Park, established to protect the nesting areas of sea turtles. Inland of the conversation park, much of the land is state reserves or subject to other restrictions designed to support the wildlife objectives of the conversation park. Prior to 1913, Bargara was officially known as Sandhills. The Sandhills Provisional School opened in 1893, and was renamed Bargara State School in 1921. The name Bargara is derived from the names of two adjacent localities, Barolin and Woongarra. Bargara Post Office opened by 1923 (a receiving office had been open since 1912). On Australia Day 2013, Bargara was struck by a tornado spawned by ex-Tropical Cyclone Oswald. The tornado damaged over 150 properties, and injured up to 17 people, 2 seriously. According to the 2016 census of Population, there were 7,485 people in Bargara. Aboriginal and Torres Strait Islander people made up 2.7% of the population. 76.3% of people were born in Australia. The next most common countries of birth were England 6.4%, New Zealand 3.2% and South Africa 1.6%. 90.8% of people only spoke English at home. The most common responses for religion were No Religion 25.3%, Anglican 21.3%, Catholic 19.9% and Uniting Church 7.6%. Bargara is serviced by two major retirement resorts that cater to a predominantly older demographic; Palm Lake Resort and Carlyle Gardens Retirement Village. The main commercial precincts are the strips on Bauer Street between See Street and The Esplanade, and the section of See Street south of Bauer Street. Bargara Central Shopping Centre located at the corner of Davidson Street and Bargara Road is the main large-scale shopping centre servicing the town. It has two supermarkets, Woolworths and Aldi. There are several restaurants and fast food stores. Three other plazas lie adjacent to the Bauer Street commercial precincts, namely Coral Coast Plaza, Bargara Beach Plaza. One more small shopping complex exists at the entrance to the Carlyle Gardens Retirement Village on Woongarra Scenic Drive. Despite being a mediumtown, Bargara does not have an educational institution within its boundary. The nearest school located on the outskirts of the town, Bargara State School, actually lies in the nearby locality of Mon Repos. The town is serviced by the main roads of Bargara Road, Bauer Street, See Street, The Esplanade, Miller Street and Woongarra Scenic Drive. Bus route no. 4 connects Bargara with the City and Sugarland Shopping Centre, running 7 days a week via Bauer Street, The Esplanade, Miller Street and Innes Park North. ^ a b Australian Bureau of Statistics (27 June 2017). "Bargara (State Suburb)". 2016 Census QuickStats. Retrieved 11 March 2018. ^ a b "Bargara - town (entry 40971)". Queensland Place Names. Queensland Government. Retrieved 14 March 2014. ^ "Bargara - locality (entry 44684)". Queensland Place Names. Queensland Government. Retrieved 12 September 2016. ^ "Bargara State School". Queensland Government. Archived from the original on 6 July 2011. Retrieved 28 January 2010. ^ Marsh, Vanessa (26 January 2013). "Tornado couple transferred to Brisbane hospital". NewsMail. Bundaberg. Archived from the original on 6 January 2014. Retrieved 14 March 2014. Wikimedia Commons has media related to Bargara, Queensland. This page was last edited on 18 April 2019, at 20:32 (UTC).